We would like to take this opportunity to underscore our business position: Andalucia Olvera Properties is an estate agent, and we keep our costs to the clients at a minimum while providing the best service that we possibly can. We ensure that all the paperwork on a property, prior to the sale, is as up to date as the Spanish authorities can provide, and inform our clients about any processes that may be outstanding at the point of exchange of contract. We strongly suggest that all of our clients use the services of a structural surveyor prior to purchasing, so that there are no hidden surprises. If builders are required, we have a list of local builders and recommend that you use local companies, that are fully insured and professional (i.e. all the workers are legal and paying social security). We strongly advise that architects, translators and site managers are used for larger jobs, in all cases that more than two itemised estimates are obtained for any job and that a visit to work done previously by the chosen builders is granted and viewed in detail. We also can provide a list of architects, people who will do site visits and translators. Andalucia Olvera Properties is NOT in the construction or building profession and we do not take on or recommend any building work. You are advised to get help from a lawyer (a local Spanish lawyer is better versed localy and could be considered a minimum requirement) when purchasing property. A 10% deposit is some times required although often less is acceptable, to hold the property from the market for 4 to 8 weeks depending. This allows a breathing space so that all relevant documents can be brought together for scrutiny. This is a good time to check that NIE (see below) and bank accounts etc. are in order while the property is Under Offer. If the completion of the sale does not take place the deposit is non-refundable and it becomes the vendors. Conversely if the vendor accepts another offer during this time period they are obliged to refund double the deposit. Often property in Olvera is in need of some renovation and you need an idea of what you are prepared to do. We highly recommend that a survey be done, by a registered surveyor, to ensure that the structure is sound and that you are buying what you expect. This costs in the region of 300€ to 400 €. If furniture or some subsequent service or commodity are included within the sales contract we would recommend a complete inventory of expectations to be signed in front of legal representation. In order to start negotiations you will need a local bank account and (although this seems to differ in different provinces and even within different districts) a “Numero Identificacion Extrañero” (NIE) or a NIF if you are resident in Spain. 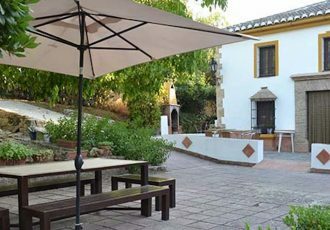 The Notaria in Olvera insists on this identification number for all house purchases – on its own, a U.K. Passport cannot and will not do. All you need is a passport or NIE. Allow a week, minimum, to have this legal process completed by the Policia Nacional (Estranjeros). You will need a passport and a completed application document. A lawyer with power of attorney can help do this for you. Olvera Properties can arrange the document needed to apply for your NIE and a ride to the nearest Policia Nacional (Estranjeros) to complete the process as well as picking up your documents a week later should any of our clients require this service. An NIE is essential to purchase property and is required for such things as; buying a car, sending you children to school, making a will, running a business as well as for becoming a Spanish resident. You do not need residency in Spain to purchase a property in Spain. If you spend more than a certain time (ask your lawyer) in Spain or have some business in Spain you may need to become resident. For U.K. residents it is easy to obtain Spanish residency as we are EU members. Once you have a property, go to the town Hall to register using the “empatronada” form. You require proof or residency, in this case the property deeds or “copia simple”, along with your NIE, employment details and tax records. About a week later you will be provided with your NIF which completes your Spanish residency. This is a “quick” way of transacting the sale and is a “spit-on-the-palme-and-shake” deal. This method can have difficulties if all the legal niceties are not followed. Paperwork (such as the “nota simple”, mortgages and land use agreements) is essential if you want to have a problem free purchase. Ensure all parties concerned are in agreement. If you wish to get a mortgage on the property you have to complete your purchase this way – we advise buying with a registered document. The Registry´s office (“La Oficina Notaria”) will require all paperwork, including any possible outstanding bills or fees against the property, and will sign-off all legal aspects for a fee. All paper work must be checked by your lawyer before being submitted to the Notary. There is a 7% government tax on a house purchase price. The notary, registration and lawyers fees are usually around 2% of the purchase price. Thus an approximate working figure of 10% of the house price for these taxes and fees is a good guide. Allow 100-200 Euros for change-over-of-name and helping with banking details (such as direct debit) for water, electricity and council tax, although in reality this figure is normally much lower. Local agents who handle these procedures are not Olvera Properties’ personnel. On this site we include in the price, all agency commissions*, unless we have been asked to broker another arrangement. You receive no further overheads when buying (or selling) a property through Olvera Properties. 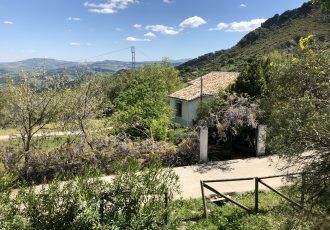 Around 100-200 euros a year for IBI, the equivalent of the community charge, for a 3 bedroom house. About 50 euros a year for basura, rubbish collection. Electricity, water and phone are all private companies. while the first two are likely to be cheaper, phone bills are typically higher than in the UK. Shop around or use a “Voip” application on your computer. 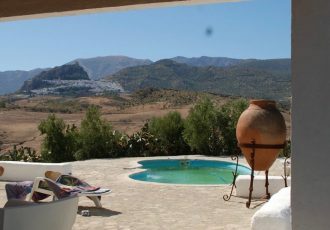 Internet access is readily available in Olvera and Pruna – depending on your requirements and the company you go with – charges from 25 euros a month and upwards can be expected. Are available for non-Spanish residents. a bank account with the bank that is supplying the mortgage. Nowadays you can only expect 60% to 70% of the purchase price, whereas residents can expect between 80% to 100%. If you are buying a house that already has a mortgage you can get it transferred into your name but the bank will require all the normal paperwork (above) prior to going to the notary. You can either obtain a mortgage locally or by using a mortgage broker. Olvera Properties will of course assist you throughout the process of obtaining a mortgage for a fee of 1%. Of course you can find mortgages in the UK for your home here but there are some considerations that you need to think over including the interest rate, the exchange rate and the possibility of needing to transfer the mortgage if you wish to sell the property at some future date. Often the number above the entrance door to the property is not the same as the number registered in the escritura or the catastral. This is normal for Olvera and other small towns in this region because as streets (and families) grew the numbers changed physically but not at the same pace as the records. In order to clarify the issue Olvera Properties has asked the notary to put a complete description of the property numbers in the escritura which they now do. The law now states that non-residents are treated the same as residents and native Spanish with regards to capital gains tax, however residents are given specific tax breaks. If this is your primary residence in Spain you have 2 years to reinvest in another (primary residence) house, when the appropriated amount will be returned upon purchase (i.e. the sale is effectively tax free). Capital gains tax is now 18% for both Spanish National and non-residence.